The location was to Roslynn VA for a return visit to a friend we had made recently. The "Take It!" 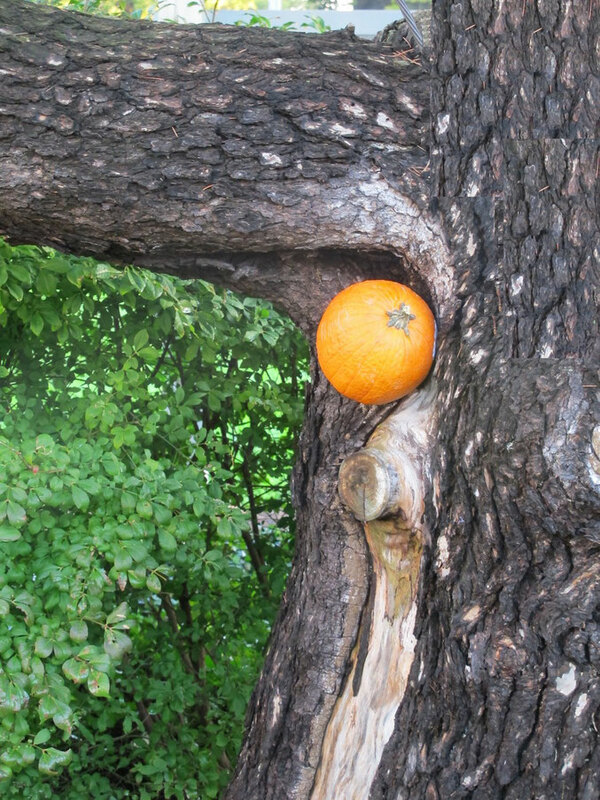 Was planned some time ago as had an afterthought about staging a pumpkin in the mouth of a tree that had the form of an elephant's mouth and bringing in the rest of the needed imagination - a measure of trunk. The placement of the pumpkin in the mouth of this friendly beast was to give it a pre Halloween treat for the fun of the extension of fantasy. To those that I showed this photo to I was rewarded with a smile and that look I sometimes get when I put some creativity to work. All of this is a gift for which I am grateful. The sharing of all this - was the original and continues to be the intent. Good balancing act with the pumpkin! Hope you all had a good halloween! Ha..... this is a funny picture. I will have to show it to my husband. Happy Halloween to you too Whuttzat. Hope you got lots of leftover candy. What an odd looking tree, made even stranger by the pumpkin hanging out of it. Has I not had the desciption here I would have been pretty baffled.